Harvest season is everyone’s favorite time of year at the ranch. To this day we harvest our olives, which are from the ancient olive trees that grow on our lands, in the same way as before hundreds of years. Olive production is cyclical, with good years following bad years. About 90 – 95 percent of the Palestinian olive harvest is used to produce olive oil, with the remainder being used for pickling and table olives. By spring the olive trees begin to flower, and we get our first glimpse of the season ahead. The spring bloom turns to baby olives in early summer, and by fall we can tell how many olives we’ll be harvesting, and how well formed the fruit is that year. Harvesting is generally done in the fall. It begins usually around the middle of October and goes through to late of November depending on weather conditions. It is conducted manually and is a critical time for establishing quality. To produce the best oil, the olives must be harvested at the correct time, using the proper techniques, and immediately moved to presses. When the olive harvesting season begins, the hillsides of our farms crawl with farmers and bring the hills alive with people working to gather the precious crop. Olives are picked by hands as they have been for thousands of years. Farmers carrying large plastic sheets, heavy ladders, and plastic boxes which designed in a special way to maintain the olives inside them cool during storage. Once there, the plastic sheets were spread on the ground under the trees and the ladders leaned against it. 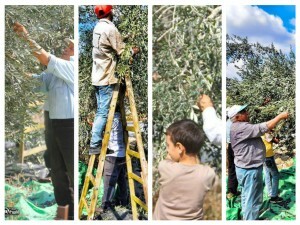 The farmers climb in to the trees using ladders to pick those olives by hand either one by one or grasp each branch near the trunk of the tree and then strip it quickly right along to the other end. 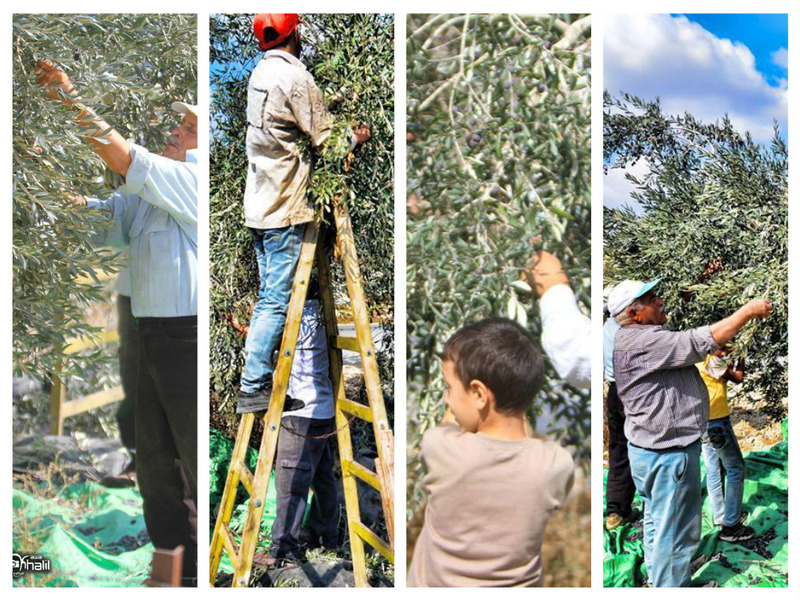 When the branches are too high to reach, the farmers use long sticks to shake gently the branches to knock down the olives. The olives fall to the ground on the top of large plastic sheets that are laid around the base of the tree. The plastic sheets are then folded so the olives, twigs and leaves gather in the centre and are then transferred to the special plastic boxes to transport to the press. We care of the temperature of the olives to not increase until they are taken to the olive press by putting the olives in special plastic boxes, these boxes are designed specially for olives harvesting. The boxes have holes from all sides to make the air enter inside the boxes and there are 5 cm high on the top of each edge of the box so when we put the boxes on several layers, the distance between the layers will be 5 cm which allows the air to enter between the boxes layers to cool the olives. In addition, while the olive boxes at the presses, they always in cool areas. Accordingly, we guarantee a good air circulation from all the sides so the olives temperature will not rise. Not all the olives are sending to the presses; we made some of them as pickled olives that are so famous in Palestine. There are several types of pickled olive and you can use salty water or olive oil for pickling.